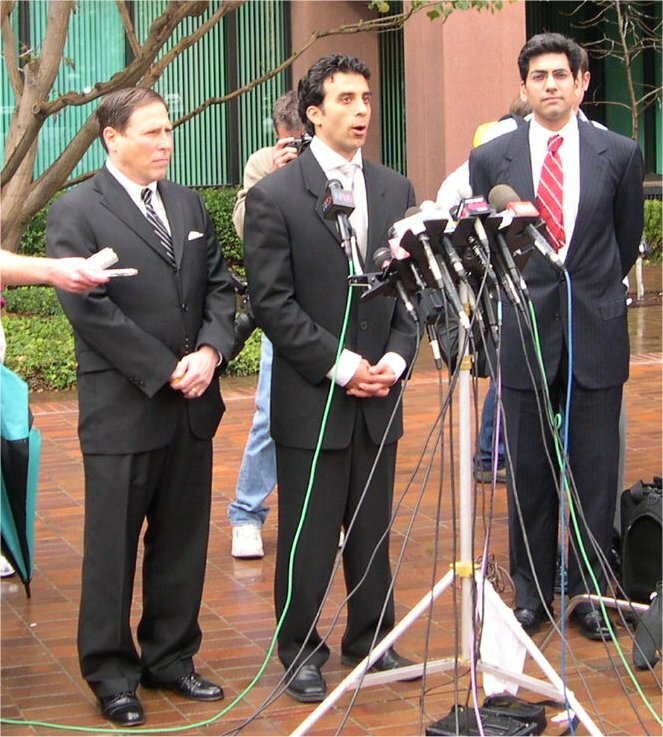 I went to Cunningham's sentencing today (Friday March 3, 2006) at the U.S. Courthouse in Downtown San Diego. There were lots of news camera and vans around all day. I listened to Judge Burns deal with a counterfeiting case and drug user parole violation case in the morning. Burns seemed even-handed and careful in his rulings. I then went upstairs to wait in line for the sentencing in a bigger courtroom. I talked to Union-Tribune columnist Logan Jenkins who happened to be nearby in line. Most of the people were press. I knew the names, but didn't know what they looked like. I saw Seth Hettena of the AP, who has written several Cunningham articles. Then we were led in. The seats were split between the press, public, and family (includes Cunningham friends). The friends I recognized were Congressman Duncan Hunter, Father Joe Carroll, Dan McKinnon (son of a former congressman; Dan is boarding Cunningham), and Cunningham's RIO in Vietnam, Willie Driscoll. Former Congressman Clair Burgener, who has Alzheimers, sat directly in front of me. The children were not present, at the request of Cunningham (and his wife was not present). The defense and prosecution plead their cases, rehashing what were in their previously-filed briefs. Cunningham made a statement. He seemed emotionally and physically weak and sad, and much thinner. I couldn't hear all his statement, as his voice was shallow, but it seems some of the press did (with better seats). He expressed regret for what he did. The one sentence I wrote down was: "I think I'll trust my friends less, your honor, so I won't make those same wrong U-turns [criminal acts]". Burns listened carefully through it all. • $2.4 million bribe earns 16 sentencing "points"
• 2 points for obstruction of justice (prompting rug vendors to lie). • -2 points for assistance to Department of Justice (more reduction may be coming for future assistance, but it's too early in the investigation). • Total of 33 points, giving 135-168 months to sentencing guidelines. • Bribes spread over 5 years, 2000-2005 is aggravating. It wasn't just one "U turn". • The $2.4 in bribes "emasculates" all other bribes. • Hugely affected confidence in government. • Burns was bothered by Cunningham's bullying. It was reprehensible, beyond pale. Defense officials were trying to do their jobs. • Burns was confounded by the choice you (Cunningham) made. Burns recalled reading an article about a lobbyist who made $2.5 million in 2003. Burns didn't name the lobbyist, but said Cunningham knows who he's talking about [my note: was this Bill Lowery, who earned $2 million in 2003? See http://www.signonsandiego.com/news/politics/20051223-9999-lz1n23lewis.html ]. Burns said Cunningham with his stature in Congress should have earned at least twice as much in a year as a lobbyist if he wanted more money. Burns said you (Cunningham) weren't wet, cold, hungry, yet you did these things (took bribes). • Burns said the real harm was loss of confidence in government works. • Burns lamented that politics today is more shrill today. Opponents are now "enemies". Burns said he was an optimist, that your (Cunningham's) conduct was an abberation (among members of Congress). • Burns took in account Cunningham's brave military service in an unpopular war. — Charles Nesby — Cunningham mentored Nesby at a time when Black pilots were rare. • 3 years suspended release. • $1,804,031.50 tax liability to be paid at $1500/month while in prison and $1000/month after release. • Forfeit $1.8 million in cash. • No upgraded sentencing score. We all left the courtroom and there were a billion (or so) cameras and newspeople outside the courthouse. 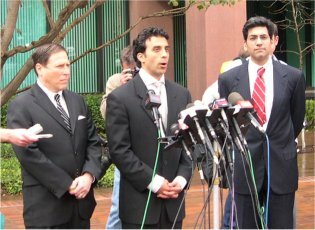 Outside, the prosecution gave a quick news conference, as did Rep. Duncan Hunter, Fr. Joe Carroll, and Dan McKinnon. Cunningham was immediately imprisoned across the street at MCC San Diego. Great keep his @!#$ in jail. The guy is a blowhard, a crook, and a scumbag. But we should all say a prayer for him because he is still a human being. He will probably die within the next 1 - 2 years anyway. Thank you for being there for us - reading your account was like witnessing. Such a mean spirited person Duke was. He does now seem to have a broken and contrite heart - but his deeds could not go unpunished. I would investigate Duncan Hunter for the same types of crime as the Duke is now convicted of- Hunter dealt with the same crooked contactors. He and the Duke found "Jesus" together - Hunter is hoping that the Duke doesn't rat him off. As for Father Joe - I'll never contribute to that SOB again. Last time I saw him, he was feeding his face in Little Italy at someone else's expense - he is on the take to a certain extent too. All birds of a feather! He must love Little Italy, I've seen him there also. He reminds me of a certain astronaut that lives in Rancho, never picks up a check. Another Duke supporter, figures. Wow. Since I live in Arkansas, I just heard about this. Being a pilot myself, "Duke" Cunningham has been one of my Aviation heroes. The story of his dogfight which earned him the title ACE is one that is worthy of a Hollywood movie. I always swore that if I met the man, I'd buy him a beer. I guess that's why they say, `never meet your heroes'. I'll still respect the pilot, but not the man. How dissapointing.